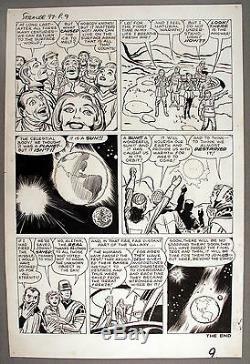 Kirby Twice Up Strange Tales #97 Pre-Hero page, last page of cover story. Which shows a new sun being formed, and the populace of Earth rejoicing. Because the world isn't ending. Measures 13.75"X 21". Joe, Ted, Jose, and Lisa See us at shows around the country! The item "Kirby Twice Up Strange Tales #97 Pre-Hero page, last page of cover story 1962" is in sale since Monday, October 03, 2016.